Presto introduced a new concept in popcorn poppers in 1978. The PopCornNow continuous corn popper was among the first poppers to use hot air instead of hot oil to "explode" kernels into crisp, plump puffs of popcorn. This new popping method produced a lighter, healthier snack and the popper quickly became a favorite of health conscious Americans. Obviously Presto has taken their air popper through numerous revisions since that time. The culmination of those iterations is today's version called the Presto PopLite popcorn popper. 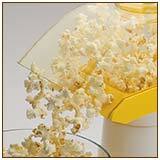 This air popcorn popper has a popping chamber that holds the kernels to be popped. At the bottom of this chamber is an opening, covered by a screen, where heated air is blown up through the kernels by a fan. This tosses the kernels about, but more importantly, heats them up. As a kernel heats up the moisture inside turns to steam and builds up pressure until it finally explodes to form the popcorn flake. Since the flakes are much lighter than the kernels they get blown out of the chamber and flow down an exit chute into a waiting bowl (See photo at left). This is one advantage to an air popper over any other type of popcorn popper. Unlike other poppers, once the kernel pops, it is quickly removed from the heat and moisture found in the popping chamber. That's why the popcorn produced by an air popper is a little drier and more crispy than from other types of poppers. Some folks like this characteristic in their popcorn, other do not. The popper has a measuring cup built into the cover which is very convenient. You can also use this cup to melt butter during the popping process. If you plan to use this your need to only use soft butter or it will not be fully melted. I prefer the microwave for preparing butter. 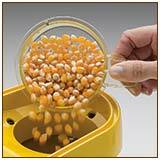 One big advantage of the PopLite popcorn popper is that it is easy to setup and clean. Since there is no oil involved it is inherently less messy. If you don't use the butter cup you just need to dump any residual kernels out of the popping chamber and wipe everything down with a soft cloth. The PopLite popcorn popper is fast. It takes just 2-3 minutes to pop more than 4 quarts of great popcorn. 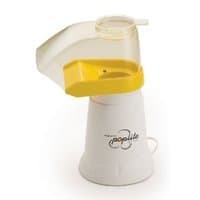 The PopLite popcorn popper is an efficient popper and leaves very few "old maids". One issue with the popper is that it's not uncommon for a few unpopped kernels to "jump" out of the popping chamber prior to the popcorn starting to pop. This problem can usually be mitigated by tilting the popper slightly away from the bowl until the popping commences. The overwhelming majority of users of the PopLite popcorn popper are very satisfied with the popper. They like the drier, more crispy, flakes. Those that don't like oil on their popcorn, for a variety of reasons, prefer air popped to other oil-based popping methods. All appreciate how little effort it takes to keep the popper clean. The PopLite popcorn popper is also one of the fastest ways to make popcorn. Moreover, it is very good at making several batches in succession if you're making popcorn for a crowd. Finally, the PopLite may be the best value of all the poppers since it's very inexpensive. There were a small percentage of users who were not satisfied with the PopLite popcorn popper. By far the most common complaint was the lack of an ON / OFF switch on the popper. Most felt this was a design error that was inconvenient and some even felt this was a safety hazard since there would be sparks at the plug when it was unplugged. If this is a concern for you I would recommend you purchase a Plug-In Switch . This inexpensive electrical accessory will allow you to turn the popper ON and OFF without any sparks or other issues. Depending on a number of factors users report that unpopped kernels will "jump" out of the PopLite popcorn popper at the beginning or end of the popping cycle. Tilting the popper away from the bowl and / or lifting the measuring cup at the top of the PopLite may help alleviate this issue. Also, if the popcorn kernels are small and light weight they will be more likely to jump out. So I recommend using the larger "Premium" brand popcorn with an air popper. Air poppers are quite loud so it will probably be difficult to make popcorn as others watch a movie if the kitchen is near the television. Another recurring theme among the dissatisfied users was the unreliability of the PopLite popcorn popper. The poppers they purchased didn't last very long - from several weeks to less than a year. Keep in mind that this was in a small minority of cases.